"This is so beautiful," the man from Genoa, Italy exclaimed. "I think I have the good side." 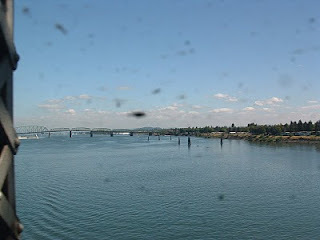 We were aboard Amtrak's Cascades traveling between Portland, Oregon and Seattle,Washington, passing through a part of southwestern Washington that I had always considered 'somewhat boring'. 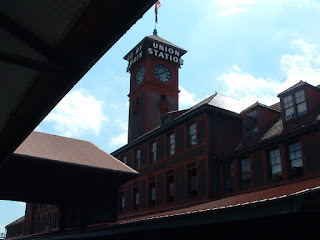 I had met the Italian in Portland's train station while we waited in a long line for seat assignments. Having completed the business portion of his Pacific Northwest trip he was traveling by a train to the area's largest cities: Portland, Seattle and Vancouver, B.C. He asked for recommendations on what he should see; I ticked off the usual tourist sites as we inched our way towards the counter. We'd chatted again as I made my way to the dining car for coffee. Back in my seat, I thought about his enthusiastic declaration and realized that I was guilty of traveling a familiar route, close to home and simply taking it for granted. * Winlock, Washington, just south of Tacoma, home of the World's Largest Egg - the conductor announced it but unfortunately a freight train kept us from seeing it. It is 12-feet long and weighs 1,200 lbs - no joke; follow the link I provided above. * Speaking of Tacoma, if you pay attention as the train eases into the station from the south, you will go under the Chihuly Bridge of Glass with its Crystal Towers gleaming above you. * Passed a town I don't think I'd ever paid attention to before called Bucoda but its been around since the 1870's when it served as home to the first Territorial State Prison. * A profusion of blooms filled acres of flower gardens along a portion of our route making me wonder if they were the Hmong Gardens I read so often about in newspapers; the ones that had suffered from our strange northwest weather this year. 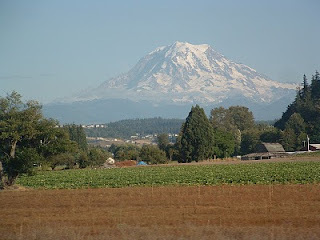 * And then there was Mount Rainier, at 14,411 feet (4,392m) the highest mountain in Washington State. In the late afternoon sun it beauty was so striking that other passengers roused themselves from napping to take a look. Wish I could tell the Italian visitor that -- thanks to my brief encounter with him -- I won't ever take this trip for granted again.